Hi guys. 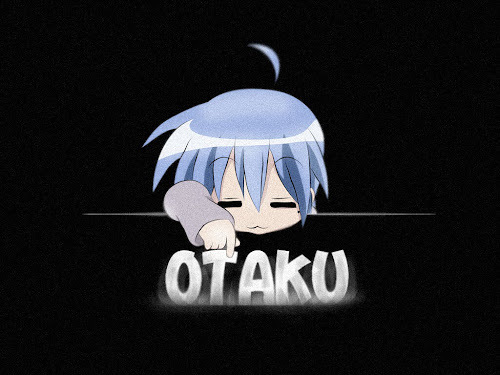 Sorry for the two week hiatus. I was extremely busy with some personal matters. Plus I was a mom for week. That did not end badly though. Anyways, I did say I'd do another Bloodcraft Tempest breakdown so here it is. Trivia: These are all cards that I have. 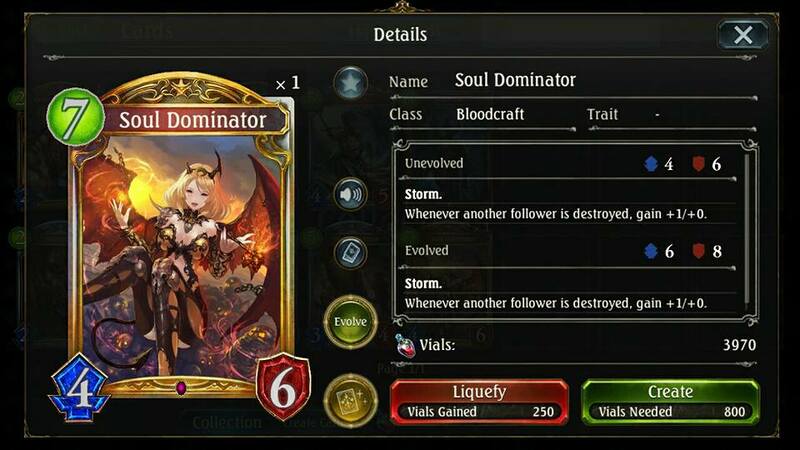 Soul Dominator is quite an amazing card in the sense that it takes advantage of mobs dying to power itself up. Its a Storm card too so that's the cherry on top. The 7-cost it has is actually pretty adequate to what she brings into the fight (Imp Lancer is a 3/6 Storm at 6-cost so I think its fair). However, it is definitely hard to actually maximize her potential. There are area spells strong enough to hit the field and feed those corpses to this girl but the cost makes it impossible to do so. You either utilize that storm with its base attack this turn and hope it doesn't die the next turn or set the field up with area damage cards and then set them off next turn. Both are hard to do. Very hard. I'll talk about the more useful person first. 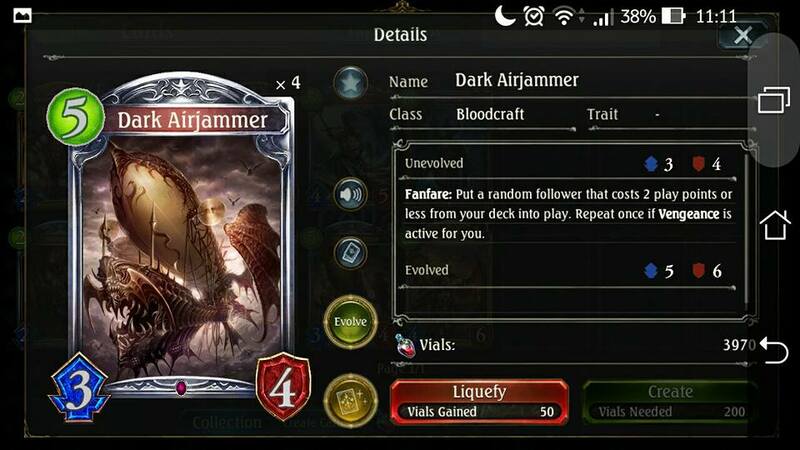 Dark Airjammer has the effect of summoning 1 (2 if Vengeance) 2-cost or less monster from your deck to the field. This is useful for a lot of stuff. One example would be to use them to bring Blood Wolf into the field. 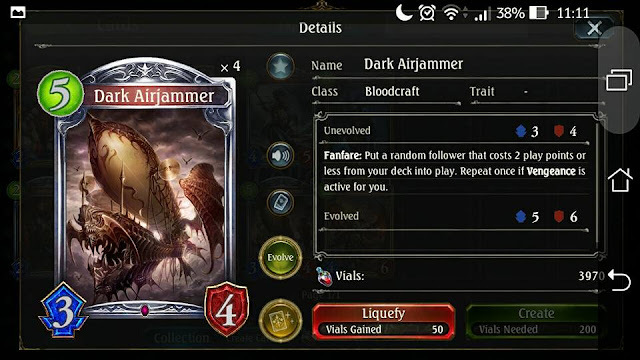 The wolf's Fanfare effect won't activate because its summoned from the deck and you'll have a 2/1 Storm creature on the field (again, 2 if vengeance). I know this doesn't really help much but its sort of a wildcard that could help you in sticky situations I guess? 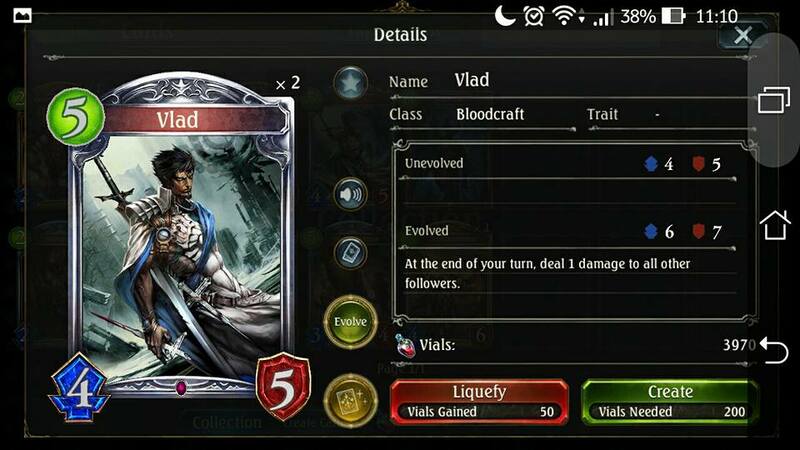 Next you have Vlad. In a way, this is sort of a cheaper Flood Behemoth (but in a way I think its sort of worse?) as its a 5-cost but it deals 1 damage to all other followers at the end of your turn if its evolved. Up until now, I've only ever use him in extremely tight situations believe me you, Flood Behemoth does it better. Yeah. Definitely a very interesting set of bronzes. 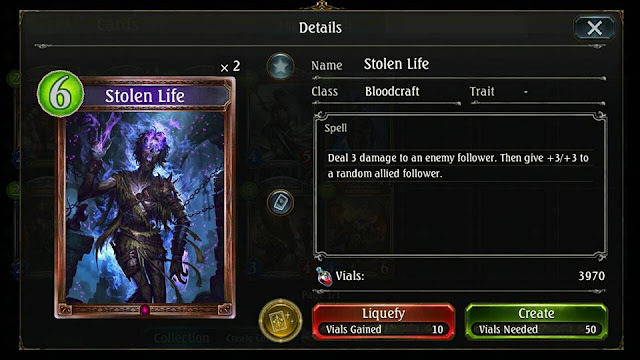 I think Tempest has got a lot of unique bronze cards that can help people build more solid low-cost (as in vial cost) decks especially beginners. First of all, I have been waiting for a low cost Bloods Ward card and here it is. Spiderweb Imp makes for a good safety net in tough spots as it is low cost and its 1/4. That is definitely enough to tank up some damage. Plus, if you manage to call it up using Dark Airjammer's ability, you don't have to worry about that self-damage. 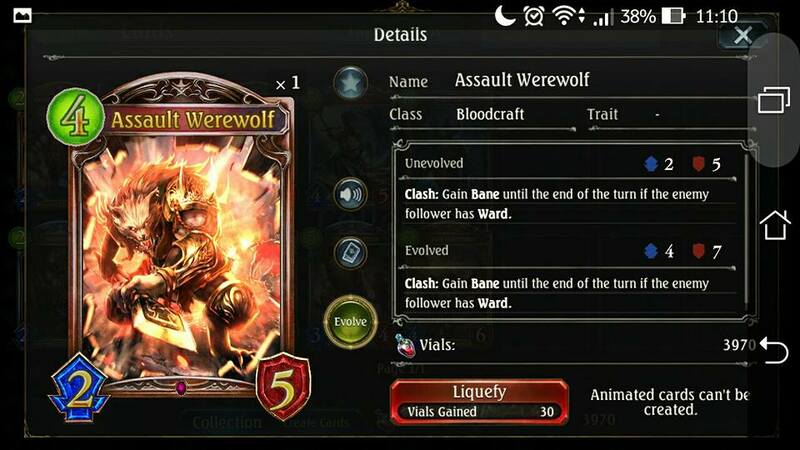 Then you have Assault Werewolf that has a conditional Bane. We all know Bloods have quite a few Storm cards and its annoying when wards block you way to Stormapalooza. This is a cheap way of countering it (yeah well for immediate effect you're gonna have to evolve him) and pressuring the foe from putting up wards. It definitely has that psychological effect. Look at him. Even he doesn't care about this. Look. 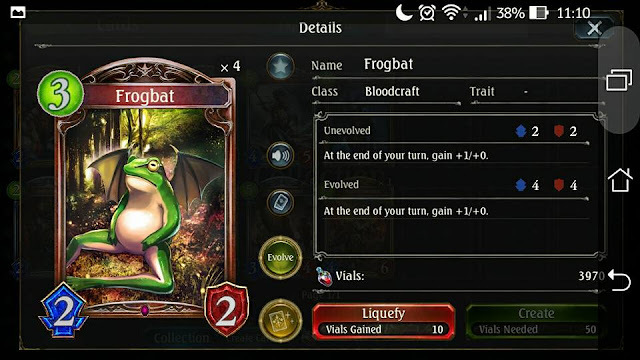 Another pressure-styled bronze card is the Frogbat. Its weak (2/2), cheap (3-cost) and yet you really don't want to ignore it. This idiot gets a +1/+0 every time your turn ends so the longer the enemy leave it be, the stronger it gets. Yes wards can definitely block Frogbat's damage but you can always put Assault Werewolf on the field to counter that. Pretty synergistic if you ask me. I ran out of caption materials. Lol. Last one. Stolen Life. A control spell that deals 3 damage to an enemy and gives +3/+3 to an allied follower. 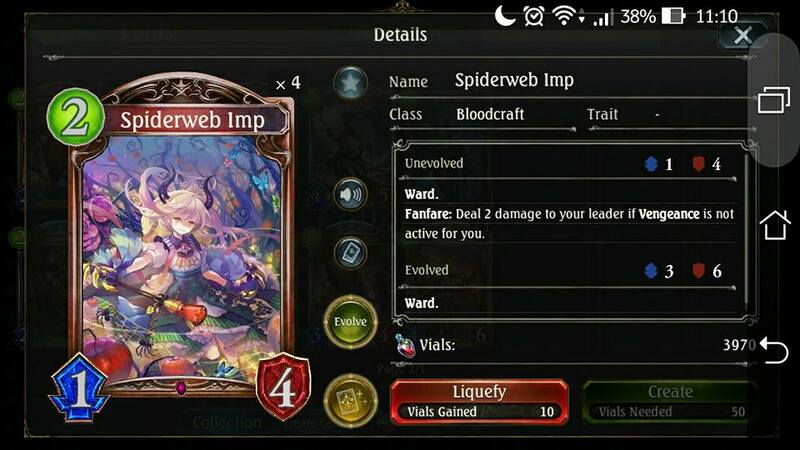 Its a bit costly but its a buff+control in one card. Best used to clear a ward and make way for a Storm while buffing it up. So yeah. I still haven't gotten to testing the whole Belphegor+Bloody Mary combo. My friend who has the deck to test it is a tad busy right now I guess. I'll definitely update on that. If any of you tested it, do tell me if it works or not. I'm curious myself. Wolvenciel, signing off.